Touch Bible for iPad, read and search the bible with free study material, several modern translations without needing the internet. iTunes users, click "More" for info! Touch Bible does not require the internet to look up scripture! Take a powerful collection of bibles and study tool anywhere you go! Note: Touch Bible is free because the Bible is an incredible book that everyone should have. Touch Bible gives you eight (8) bibles to read, study, and cross reference. Accessing the Bible is what sets this application apart. "Dial a Verse," makes access to scripture and different translations really fast. It is wonderful in church! Touch Bible Loaded has many fantastic english translations built in, including the innovative New English Translation ( with partial study notes ) built into the text. – Keep study notes, even while you read! ----Keep notes, attach them to EVERY verse. 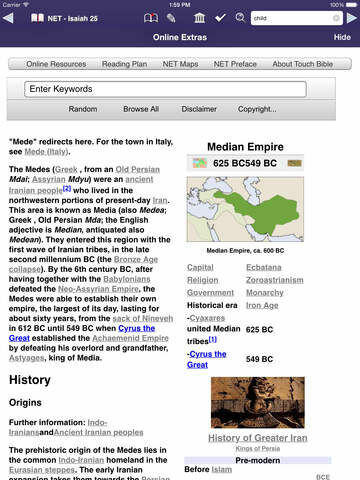 – Bookmarks - Click the verse number and that verse is bookmarked for quick access later. 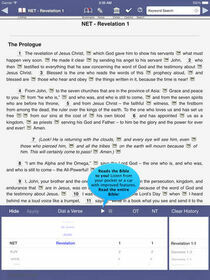 – Dial-a-Verse - Touch Bible's exclusive way of looking up scripture FAST. – Switch to "Night Mode" for reading in low light situations. – When you reload Touch Bible, it remembers the last chapter you were reading.